The North American B-25 Mitchell was a medium bomber manufactured by North American Aviation. It first gained fame on April 18, 1942 when sixteen B-25Bs attacked mainland Japan in retailiation for the bombing of Pearl Harbor. It was used by allied air forces in every theater of World War II and by many other air forces after the war ended. 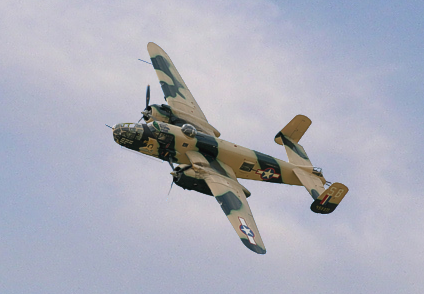 The B-25 was named in honor of General Billy Mitchell, a pioneer of U.S. military -01a.png. The B-25 is the only American military aircraft named after a specific person. By the end of its production, nearly 10,000 B-25s of varying models had been built. By 1947, most B-25s had been consigned to long-term storage. However, a select number continued in service through the late 1940s and 1950s. Its principal use during this period was for undergraduate training of multi-engine aircraft pilots slated for reciprocating engine or turboprop cargo, aerial refueling or reconnaissance aircraft. Others were assigned to units of the Air National Guard. On Saturday, 28 July 1945, while flying in thick fog, a USAAF B-25D crashed into the north side of the Empire State Building between the 79th and 80th floor. Fourteen people were killed, eleven in the building and three in the bomber, including Colonel William Smith. On July 24, 1952, two USAF colonels, flying a B-25, were heading east at 11,000 feet over the Carson Sink area of Nevada, when one of them noticed three objects approaching them from the east. In a matter of seconds, three bright silver, delta shaped craft with no tails or pilot's canopies shot by the B-25 at terrific speed. The colonels got a good look as the unusual craft passed within 400 to 800 yards of the B-25. The only thing that broke their sharply defined, clean upper surfaces was a ridge that ran from the nose to the tail. The estimated speed of the UFOs was at least three times that of an F-86. When the two colonels landed at Colorado Springs, they called the intelligence people at Air Defense Command Headquarters to make a UFO report. The suggestion was offered that they might have seen three F-86's. The colonels promptly replied that if the objects had been F-86's they would have easily been recognized as such. The colonels knew what F-86's looked like. Both men had previously voiced their skepticism to friends who had "seen flying saucers". Now, from what the colonels said when they were interviewed after landing at Colorado Springs, they had changed their opinions. Delta wing aircraft did exist at the time, however they all had a clearly visible pilot's cockpit. Additionally, all of the Navy's silver deltas were on the east coast. A few deltas painted the traditional navy blue were on the west coast, but not near Carson Sink, and the Air Force's one delta was temporarily grounded at the time. Both colonels were command pilots and each had several thousand hours of flying time. They were stationed at the Pentagon. Their highly classified assignments were such that they would be in a position to recognize anything that the United States knew was flying anywhere in the world. To date, what the USAF colonels saw does not conform to any known terrestrial aircraft. The closest would be the The Northrop Grumman B-2 Spirit stealth bomber. However technical challenges did not make it possible to build it, or other high performance flying wings, until over 40 years later.